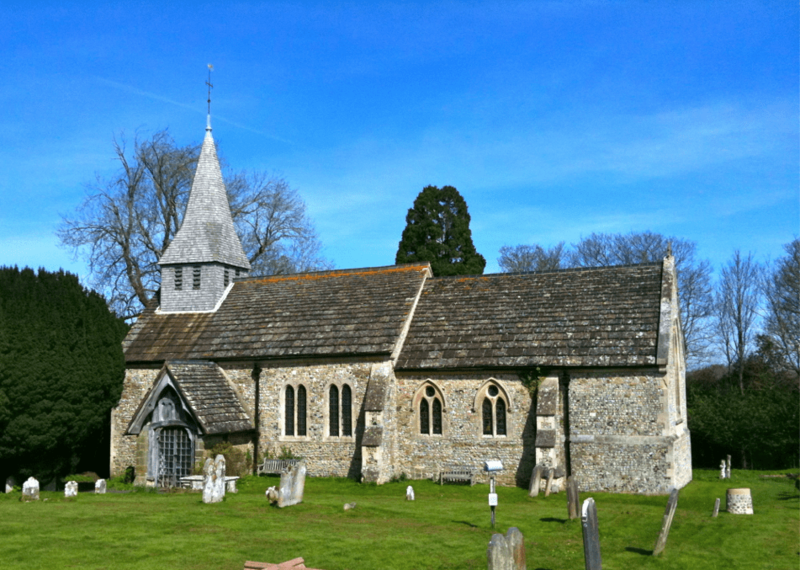 The Woodmancote Martyrs – St. Peter's Church, Henfield with St. Giles' Shermanbury and St. Peter's Woodmancote. Iohn Oswald, denyed to aunswere any thyng, vntill hys accusers should be brought face to face before him: and neuertheles sayd, þt fire & Fagots could not make him afrayd: but as the good preachers which were in kynge Edwardes tyme haue suffered, & gone before: so was he ready to suffer and come after, and would be glad therof. These foure after longe imprisonment in the Kynges Bench, were burned together at Lewes in Sussex in one fire, the day of the moneth aforesayd. These men had been imprisoned for some considerable time before execution. Plenty of time to recant, to save their lives. But they did not. “Fire and faggots could not make [John Oswald] afraid…so he was ready to come after, and would be glad thereof.” An astonishing testimony which shows a deep commitment to faith in Jesus Christ and a passionate desire to hear the Bible , and to worship in English. 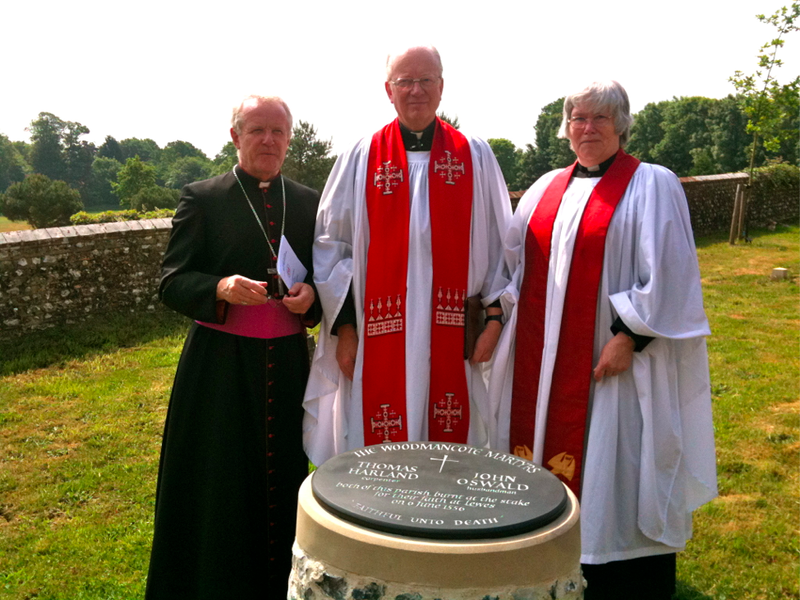 The ancient church of St Peter’s Woodmancote (there was a church there by the time of the Domesday Book) unveiled its first monument to the Woodmancote martyrs in the churchyard from where they came from over 450 years before, on the anniversary of their martyrdom on the 6th June 2010. A service of Holy Communion was led by The Rev’d Christina Bennett, NSM priest of the benefice, with a cracking sermon from the Dean of Chichester, Nicholas Frayling (see below) and St Peter’s particularly welcomed the former Roman Catholic bishop of Arundel and Brighton– Bishop Kieran Conry. A sermon preached by the Dean of Chichester, the Very Revd Nicholas Frayling, at the Church of St Peter, Woodmancote on the occasion of the Dedication of a Memorial to the Woodmancote Martyrs, THOMAS HARLAND and JOHN OSWALD, on Sunday 6th June 2010, the 454th anniversary of their deaths. The text is available as a pdf download here. I enormously appreciate the invitation to come and preach to you this morning, and the privilege of dedicating the Memorial in the churchyard on this historic occasion. Your action in creating the memorial to the Woodmancote Martyrs, Thomas Harland and John Oswald, is very important. These men gave their lives for the truth as they saw it, and have left us an example of extraordinary courage and Christian witness in the face of persecution. But, as I hope to show in a moment or two, today is about more than merely remembering. It is with remembering, though, that we must begin. King Henry VIII broke with the Church of Rome in order to try to secure a male heir. This led, according to your theological point of view, either to the formation of the Church of England or to the continuation of the Catholic Church in England, without allegiance to Rome. At any rate, the first Prayer Book of 1549 was much more Catholic in tone and theology than the Book of Common Prayer of 1662, which we know and still use. The Bible was to be read in English in every Parish Church, and worship offered in the language of the people. Mary Tudor acceded to the throne in 1553 and determined to return England to Catholicism. The reforms were reversed, the Mass was reintroduced, and the Bible was to be read in Latin. But people had become attached to the new ways, and many continued to worship in their homes and in places other than churches, in English, and in accordance with their beliefs. Luther was a fine scholar: John Oswald and Thomas Harland were simple men, just like the disciples of Jesus; but they wanted to know and obey God’s word, and the plain fact is, the Church would not let them. For us, in an era of comparative religious toleration, at least among Christians, it is hard to get under the skin of those ancient conflicts; but of course, our very faith was born in conflict by the blood of the Cross of Jesus Christ, who mysteriously promised not peace but a sword. Religion is concerned with the deep things of people’s lives, and it is for the deep things that men and women have been prepared to lay down their own lives throughout Christian history, and still are today. Your Martyrs, John and Thomas, showed astounding courage before the flames: they could have saved their lives by coming back to this church and listening to the Mass, but they refused to compromise. Which brings us to today, and the question ‘What about us?’ Well, we have come to remember these men – just as we remember whenever we come to the Eucharist, the Holy Communion, the Mass, the Lord’s Supper. ‘Do this in remembrance of me’ was the instruction of Jesus to his followers in every age. There is power in remembering, but there is much more to remembrance than glorying in the past, or pride or nostalgia. The Greek word for remembrance is ANAMNESIS, which conveys also a sense of making present. ‘Do this in remembrance of me’ takes on a whole new meaning: we remember in order to make present and move forward. In St John’s Gospel, the writer often depicts Jesus as waiting for the hour, the moment when he would perform the work for which he was destined – the hour which would change history. That could only come about through the death of the man Jesus on the cross: only then might the world understand the God who would not spare himself, but gave himself for sinful humanity. So the lifting up of Jesus on the cross is also his exaltation in glory. Once the power of the cross is recognized, the powers of darkness cannot prevail. It is not force but sacrificial love that brings about redemption – the power that lies in powerlessness. In down-to-earth language, which would have been well understood by the Woodmancote Martyrs, Christians are to prefer others over themselves, and if called upon to do so, they are to sacrifice themselves for others, as did the Lord of Glory. This they are prepared to do because of the glorious assurance of eternal life, which is given us in the resurrection of Jesus Christ from the dead. Imagine the impact of those words on people like John and Thomas, who discovered them for the first time; and beware the familiarity which so easily breeds, if not contempt, then complacency in those who know the words so well. So there is real power in our remembering today, as we make present the sacrifice of John Oswald and Thomas Harland, in the context of the great act of remembrance which is the Holy Eucharist. We do not know how those Greeks responded to Jesus and his teaching about his hour which was to come, or whether or not they followed him as disciples. But what we do know is the way in which John Oswald and Thomas Harland responded to God’s word, and in a real sense that is what has brought us together today. In the 20th Century, the ecumenical movement has come into being. It is, I think, rather stuck at the beginning of the 21st, but what it has done is to enable Christians who once killed or plotted against each other to listen and talk, to pray together and to worship, in the knowledge that what unites them is so much more significant than all that divides. We remember the historic moment in 1982 when Pope John Paul II was received and embraced by Archbishop Robert Runcie in Canterbury Cathedral, and how they went together to pray before pictures of the Martyrs – Protestant and Catholic – as two Christian leaders, united in faith, common witness and real friendship. There is an awful long way to go before we can fulfill our Lord’s desire that ‘all may be one’, but we are on the way, and what you in Woodmancote have enabled to happen today, is one more step along the road to reconciliation and unity. That is a kind of remembering – the kind that matters: to look at the past with real courage, and in the light of that looking, to move on – sadder, perhaps, but wiser, too. That must be our task.